Wait, didn't it die in 2014? Yes, but not in Japan. Our favorite (and only) retro SUV died in 2014 after a seven-year production run. 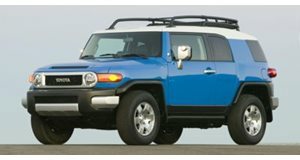 The Toyota FJ Cruiser definitely wasn’t for everybody, but those who bought them typically adored them. But, as it turns out, FJ Cruiser production did, in fact, continue post-2014 – in Japan at least. Toyota announced last week that production of the right-hand drive FJ Cruiser for the Japanese market will come to an end. Before that happens, Toyota will launch a "Final Edition" FJ Cruiser, pictured here. Painted in a special beige body color with a beige interior, it also features 20-inch wheels, bumper-mounted lights and black door handles. Power comes from the familiar 4.0-liter V6 engine paired to a five-speed automatic transmission. And yes, your eyes are not deceiving you; that is a front fender-mounted side mirror, a styling trait common with JDM cars. And no, there’s absolutely no chance in hell Toyota will send this Final Edition FJ Cruiser stateside. This is it. For good this time. So if you’re looking for a true body-on-frame Toyota SUV, your only option is the formidable, but conservatively-styled 4Runner. Will we one day be given yet another retro Toyota 4x4? Well, there was the FT-4X Concept, shown at New York last spring. However, it’s car-based, meaning no live rear axle. So yeah, the FJ Cruiser could have been it. Fortunately, there are still plenty of used examples out there to choose from. Just be prepared to pay handsomely for one.